The desert of the American Southwest blooms with natural wonders, history, art—and Jewish Life. While New York shivers and Boston quivers, Phoenix basks in sunshine, its synagogues landscaped with cacti. This oasis in the desert—where Jews could be cowboys and even mayors more than a century ago—mushroomed with the popularity of the automobile. Today, it melds 22 communities in the Valley of the Sun (formerly the Salt River Valley). Phoenix offers easy living and year-round golf, swimming, boating and hiking. And all this within reach of some of the most spectacular scenery in the country. Despite its image as a young frontier city, Phoenix has deep Jewish roots. Conversos were living in the area even before 1654, the traditional start of Jewish history in the United States, says Lawrence Bell, director of the Arizona Jewish Historical Society. Mexico’s first settlers were Conversos, Jews who hid their identity to escape the Inquisition, and this area was once part of Mexico. After Mexico ceded the area to the United States in 1848 following the Mexican-American War, Jews had an important role in developing the new Arizona Territory. After the Civil War, the modern city grew out of the attempts of prospector and Confederate veteran Jack Swilling, who arrived in the Phoenix area in 1868, to irrigate the valley by dredging the canals the Hohokam Indians had built centuries before. Aaron Bennett, the treasurer of Swilling’s company, arrived in 1870, becoming the first recorded Jew in Phoenix. He was followed by other American-born Jews who engaged in commerce and other professions; some provisioned miners in this copper-rich region. By 1920, Phoenix had more than 100 Jews, and in 1922, the Reform Congregation Beth Israel built the first synagogue, which was also a community center. In 1930, the more traditional members broke away and formed Congregation Beth El, an egalitarian Conservative synagogue. By 1940, the valley had 1,000 Jews, some of whom had come in search of respite from tuberculosis, upper respiratory diseases and arthritis. After World War II, air conditioning spurred further growth, and by 1960, the community numbered 8,000. In 1955, Beth Hebrew became the valley’s first Orthodox congregation (it later merged with Beth El). In 1965, Rabbi David Rebibo founded the first day school, the Phoenix Hebrew Academy, despite opposition from local non-Orthodox rabbis who believed the Jewish students should be integrated into the general community. The Orthodox K-8 school today has 165 pupils. Rebibo also founded the Orthodox Congregation Beth Joseph and established the Greater Phoenix Vaad Hakashruth, which supervises kashrut in the valley. Rabbi Zalman Levertov brought Chabad to the area in 1977. Today, there are Chabad congregations throughout the valley. Anti-Semitism existed in Arizona, which was a segregated state; until the 1970s, for example, the Camelback Inn in nearby Scottsdale would not admit Jews. But the state was also a place of opportunity. Emil Ganz served two terms as mayor (1885 to 1886 and 1899 to 1901). Barry Goldwater’s uncle Morris Goldwater served six terms as mayor of Prescott and was selected the vice president of Arizona’s Constitutional Convention in 1910. The three main department stores—Korrick’s, Diamond’s and Goldwater’s—were originally owned by Jews but have since been sold and renamed, and there were also Jewish ranchers and cowboys. At least one Jewish rancher, Harvey Dietrich, still operates a ranch in Seligman, a small town off Route 66. Cinderblock walls chop up the desert into modern-day homesteads, separating neighbor from neighbor. These walls and the vast size of Maricopa County (at about 9,200 square miles, it is more than twice the size of Los Angeles County) have created a unique dynamic in the Jewish community of Greater Phoenix, says Adam Schwartz, president of the Jewish Federation of Phoenix (www.jewishphoenix.org). Clusters of Jews live near Orthodox synagogues—for example, at 7th Street and Glendale—and near the Jewish community center, but there are no specifically Jewish neighborhoods. Many Jews are unaffiliated, partly because they are so spread out. Nevertheless, there is a diversity of congregational life, and “when people don’t find their niche, there is an entrepreneurial spirit to make a go at trying to develop a new synagogue, organization, havura,” Schwartz says. Thus, for example, the New Shul (7825 E. Paradise Lane; 480-515-2272; www.thenewshul.org) has a traditional but egalitarian service and uses many Carlebach melodies. Two outreach-oriented organizations are Chabad (www.chabadaz.com) and the Phoenix Community Kollel (http://aztorah.com). The most recent demographic survey dates to 2002, when the Jewish population was 83,000. In the five years prior to the survey, the community had experienced explosive growth that is probably continuing; the city itself has grown 24 percent since 2000. Schwartz estimates the Jewish population to be between 83,000 and 100,000, out of a population of nearly 3.5 million. The survey also found that being Jewish is very important to individuals and that the community expresses strong support of Israel, bringing together all streams of Judaism. More than 9,000 people attended Israel’s 60th anniversary celebration at the JCC last year. The valley is known as a place to retire, and the many elderly residents who have no family members nearby are a major challenge for Jewish community services. Yet as many under-18 Jews live there as do Jews over 65, and now day schools have become popular, with half a dozen Jewish day schools in Phoenix. Many Jews have moved to Phoenix from Southern California; a notable number have come from other parts of the United States, including the Northeast. In the 1980s, Jews from Bukhara, Uzbekistan, started arriving. They have strong ties to Orthodox institutions, including Chabad, and own restaurants and barber shops. Avdey Torah Hayah (602-518-0229) is a Hispanic congregation in the East Valley whose members are Conversos. Many of them are in the United States illegally and live in fear of deportation. Hadassah has thousands of members in several chapters in the Phoenix area. Contact information for the chapters can be found at www.valleyofthesun.hadassah.org. Arizona Adventurers (www.arizonaadventurers.org) is a Jewish singles group for outdoors-minded young adults. The Arizona Jewish Theatre Company (www.azjewishtheatre.org), founded by Janet Arnold, is dedicated to producing theater that reflects and illuminates Jewish culture, history and perspectives. The current economic crisis has led to a new project called JsupportAZ (Jewish support Arizona; 602-748-4000;http://jsupportaz.com), to help people find jobs, financial advice and legal assistance. The new Cutler-Plotkin Jewish Heritage Center is housed in the historic Temple Beth Israel, the city’s first synagogue (in operation from 1922 to 1949), and the adjacent rabbi’s house (122 E. Culver, off 2nd Street; www.azjhs.org). The synagogue, designed by local architects Lescher and Mahoney in the Spanish mission style, has white walls and a gabled red-tile roof. When the Jews moved away from the area, the synagogue became Phoenix’s first Chinese-speaking church; in 1983, it became the Central Mexican Baptist Church. In 2002, the Arizona Jewish Historical Society bought the property, now in the heart of the city’s new arts and culture district and behind the copper-clad Burton Barr Central Library (N. Central and McDowell; 602-262-4636; www.phoenixpubliclibrary.org), which is worth a visit in itself. The synagogue and the rabbi’s house will serve as a museum, heritage and education center; events place; and house offices of the historical society when the center opens this month following preservation work. The museum, for which funds are still being raised, will showcase the Arizona Jewish experience. North of the library is the Phoenix Art Museum, which is celebrating its 50th anniversary this year (1625 N. Central Avenue and McDowell; 602-257-1222; www.phxart.org). Fashion design and photography are among its greatest strengths. Others are contemporary, Chinese and early modern American and Mexican art. The museum’s collections also include works from Western America, Latin American, Asia and Europe (Renaissance and later). Works by such Jewish artists as Seymour Lipton, Mark Rothko, Oscar Bluemner and Helen Frankenthaler are in the modern art collection. In the contemporary art collection are pieces by Michal Rovner and Sol LeWitt. According to museum director James Ballinger, the local Jewish community is very involved in the museum. The Katz Wing for Contemporary Art, funded by Ellen and Howard C. Katz, opened in 2006. Arcadia Farms, the museum restaurant, offers excellent salads and other vegetarian options. About 3.5 miles southeast of the museum stands a memorial to the U.S.S. Arizona, one of four United States battleships sunk in Pearl Harbor. The memorial, topped by the ship’s anchor and mast, is in the Wesley Bolin Memorial Plaza facing the state capitol (17th and Washington). The plaza is also home to memorials honoring figures in Arizona history and wars and events that had an impact on the state. Among the tributes is the Jewish War Veterans memorial to eight Jewish Arizonans—including Lt. Harry Urman and Sgt. Robert J. Friedman—who gave their lives in World War II. Erected in 1950, the memorial is a bronze shield affixed to a stone and set on a colorful stone base. The heritage center, library, museum and memorial plaza are all accessible by Metro Light Rail. Orthodox Congregation Beth Joseph, which has about 125 families, was founded 41 years ago (515 E. Bethany Home Road, near 7th Street; 602-277-8858; www.phoenixbethjoseph.org). In its modest sanctuary, the Ark is flanked by narrow stained-glass windows with a column motif in blue, white, black and yellow. A stained-glass panel over the entrance to the sanctuary suggests the biblical words inscribed below it, “And let them grow into a multitude.” A mikve is part of the complex. 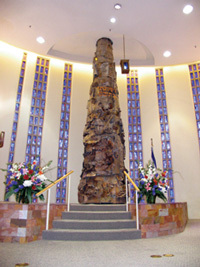 Congregation Beth El is notable for its flowing, rounded, desert-toned exterior and the round sanctuary (1118 W. Glendale Avenue; 602-944-3359; http://bethelphoenix.uscjhost.net). The freestanding Ark is a sculptural collage that tapers like a tree as it rises from floor to ceiling. Behind it are narrow stained-glass windows in blue, white and red that evoke candles. In the garden stands a square Holocaust memorial of polished black stone, designed by Gale Dubrow. It is inscribed with the words “Thou shall not forget” and the names of concentration camps. The Sylvia Plotkin Judaica Museum (480-951-0323; www.spjm.org), a biblical garden and a mikve are all part of Congregation Beth Israel (tours available; 10460 N. 56th Street, at Shea Boulevard; www.cbiaz.org). The highlight of the museum is a composite synagogue sanctuary brought from Djerba, Tunisia, with ornate floral-motif tiles and wooden Torah casings. The museum features a replica of the Western Wall, a life-cycle exhibit and temporary exhibitions. The Ina Levine Jewish Community Campus, opened in 2002, is a meeting place for many Jewish Phoenicians. Situated near Scottsdale’s Western-style shops selling everything from cowboy hats to Southwestern home decor, the campus has a stone entrance wall that recalls Jerusalem’s Western Wall. Near an Olympic-size pool, an eight-panel mural by Arthur Jacobson embodies the acts of creation described in Genesis. A preschool and a K-8 school on campus are to be complemented by a high school, for which land has been allotted. The center offers a full fitness program, including a spa and sauna. The snack bar is kosher (12701 N. Scottsdale Road; 480-634-4900; www.vosjcc.org). Taliesin West, the winter home and school in the desert of legendary architect Frank Lloyd Wright, is in North Scottsdale, at the foot of the McDowell Mountains (12621 North Frank Lloyd Wright Boulevard; tours, 480-860-2700 ext. 482). It remains the main campus of the school. It was here that Wright designed the Guggenheim Museum in New York. Wright trained with a leading Chicago firm, Adler and Sullivan, which had a wide Jewish clientele. Though Wright is said to have been an anti-Semite, he had more than three dozen Jewish clients during his career and designed a synagogue, Beth Sholom, in Elkins Park, Pennsylvania. It was his final project completed before his death in 1959. Another interesting architectural venture is Arcosanti (www.arcosanti.org), an experimental town 65 miles north of Phoenix on I-17, designed by visionary Italian-born architect Paolo Soleri, who sought to create an ecologically sound city. Soleri-designed windbells, sold to support the project, are produced at the Cosanti bell foundry (6433 E. Doubletree Ranch Road in Paradise Valley; 800-752-3187; www.cosanti.com). “Phoenix is a magnet for rough-hewn faces. Misfits, losers, con artists, ex-cons, desperate Oakies and Oaxacans, second-chance Johnnies—they all end up here, as if the city is the last fence line catching the unattached debris of a windy world.” So wrote Jon Talton in Dry Heat (Ingram), one of four crime novels he set in the city. The other three are Concrete Desert and Arizona Dreams (both Poisoned Pen Press) and Camelback Falls (St. Martin’s Minotaur). Robert Marshall’s A Separate Reality (Carroll & Graf) portrays the coming of age of the son of liberal Jews in 1970s Phoenix. As Alfred Hitchcock’s classic film Psycho opens, the title dissolves to the Phoenix skyline and then the camera pans down Central Avenue. Barry Goldwater, five-term United States senator from Arizona, was the GOP nominee for president in 1964. He is credited with reviving the American Conservative political movement. An Episcopalian who was born in Phoenix, Goldwater had Jewish paternal grandparents and sometimes referred to himself as Jewish. Filmmaker Steven Spielberg spent part of his childhood in Scottsdale, where he started making adventure films. The Last Gun, the first movie he edited, directed and acted in, was shot at Scottsdale’s Pinnacle Peak Patio Steakhouse and premiered in 1959, when he was 13—the same year Spielberg celebrated his bar mitzva at Beth Hebrew. Phoenix-born jeweler Newton Rosenzweig was a philanthropist and civic leader who served on the city council, supported the arts and was active in the Jewish community. He founded a state library for blind and visually impaired children and funded an ambulatory surgery unit for low-income families. Rabbi Abraham Lincoln Krohn, who served Beth Israel from 1938 to 1953, advocated for the poor. His successor, Rabbi Albert Plotkin, was an important figure in Arizona’s civil rights movement. Phoenix is the perfect base for visits to the erosion-carved red rocks of Sedona (928-282-7772 ext. 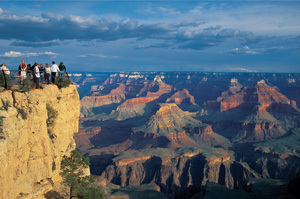 340; www.visitsedona.com), the Grand Canyon (928-638-7888; www.nps.gov) and Lake Mead in southern Nevada (702-293-8990). Even closer is the Apache Trail, once the mule trail to Roosevelt Dam. Mostly flat and laid out on a grid, Phoenix is easy to navigate, but “around the corner” means at least a 15-minute drive. The weather is best from October to May; summers are beastly hot. Visitors will easily find kosher food. Nearly all the half-dozen kosher restaurants are owned by Bukharan Jews. Even Segal’s Kosher Foods/Segal’s New Place, which includes a bakery, deli, restaurant and market, owned for 40 years by Zalman and Pearl Segal, is now in Bukharan hands (4818 North 7th Street; 602-285-1515). Samarkand, in a strip mall on the southeast corner of Northern and 19th Avenue (602-331-8991), offers such Russian delicacies as borscht and pelmeni (meat-filled ravioli in beef broth), the Uzbek specialty manty (meat-filled dumplings) and Middle Eastern-style grilled skewered meats, under Vaad supervision. It also caters special events. Kosher food products of every kind, including meats, cheeses and wines, are available at the Imperial Kosher Market (1145 E. Glendale Avenue; 602-285-6999). And if you’re cooking yourself, you can get professional-quality knives and other cooking equipment at Phoenix Knife House, owned by Israeli-born Eytan Zias (7607 E. McDowell Road; 480-946-2758; www.phoenixknifehouse.com).